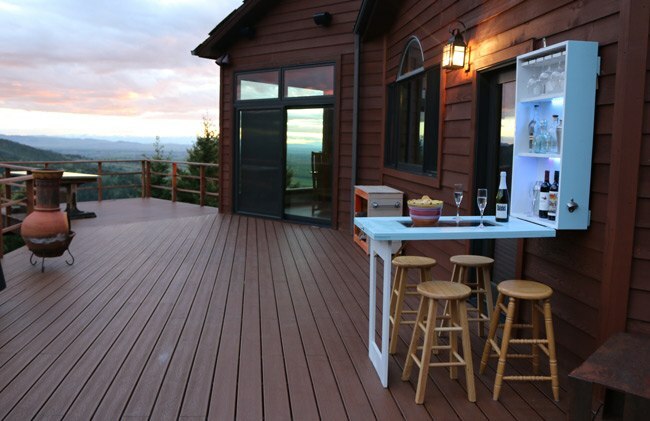 Are you looking to maximize your patio or home with some space saving furniture? If so, I have a fun concept that will spruce up any living space! It's called the Murphy Bar. Somewhat similar to a Murphy bed, yet packed with all your party favorites. This is a fun project that can be completed in a weekend all for under a couple hundred dollars. I finished the project with the new Krylon® Outdoor Décor in Satin Rainwater and Satin White Cloud. This post is sponsored by Krylon; a great brand with products I believe in and use all the time! 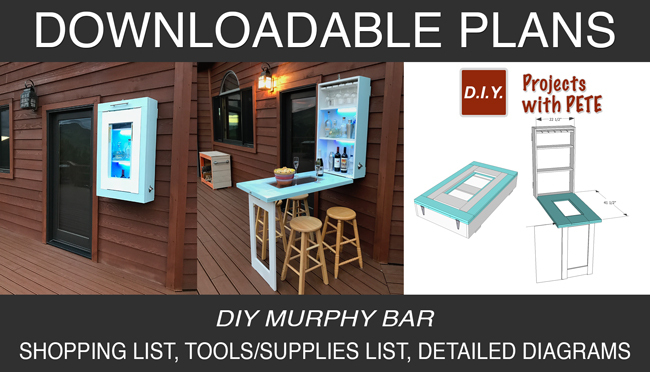 Click here to download the murphy bar plans so you can get started on your project today. 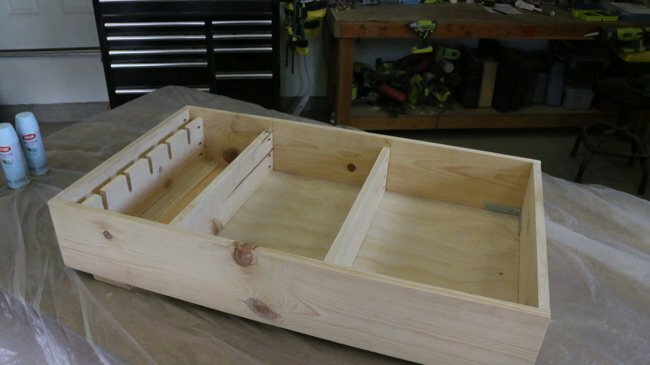 The plans include detailed diagrams, step by step instructions, a shopping list, and materials used so you can build your project this weekend! It's time to dust off those tools and to make some sawdust! Once you've picked up all the supplies and materials we'll start making the cuts. 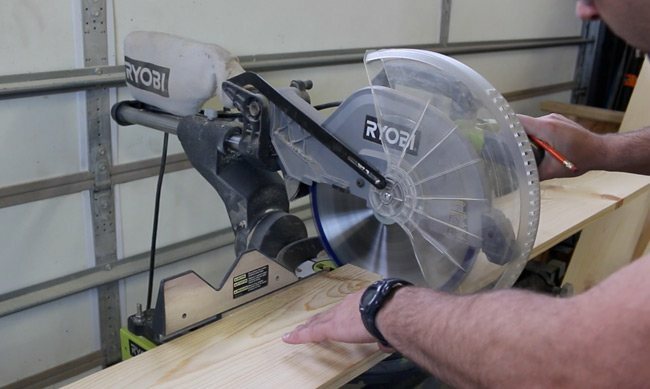 The first step is to cut the 1×8 boards to form a box. I used a miter saw for this step. 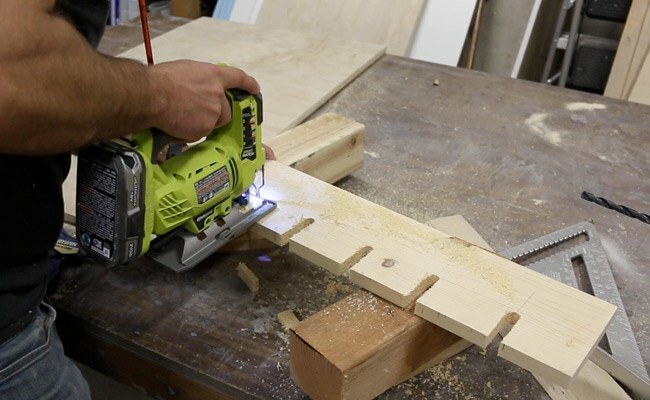 Use a pocket hole jig set for 3/4 inch stock. 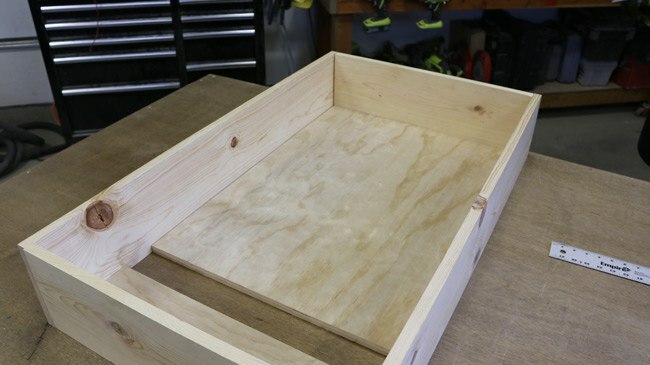 Make 4 pocket holes at the ends of the two shorter boards. 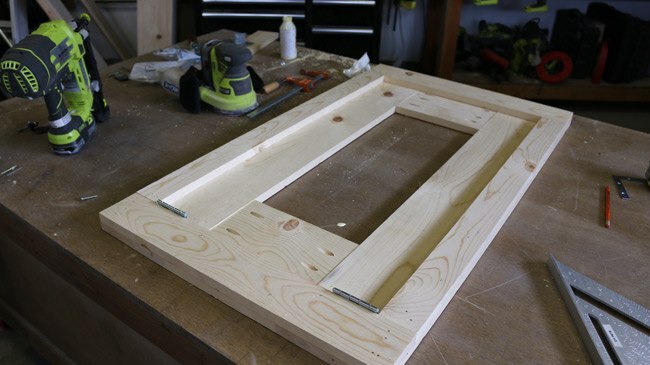 Attach the boards with wood glue and 2 1/2 inch long pocket hole screws. 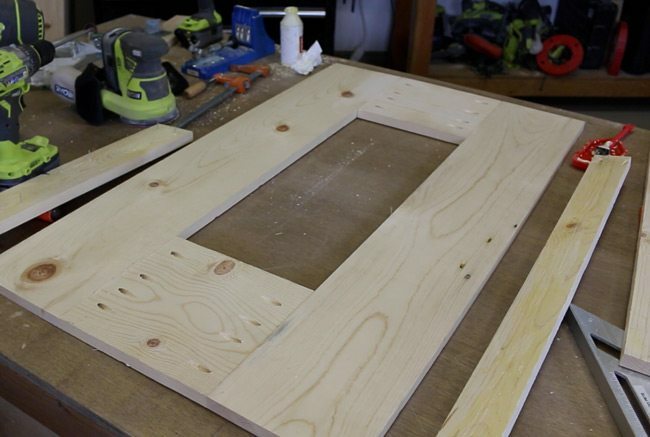 Cut 3/4 inch thick plywood which will be used to cover the back and to help strengthen the frame. You could cover the entire back if you prefer, but here is a cleat system to mount the murphy bar flat against a wall. There is a 45 degree cleat attached near the top. 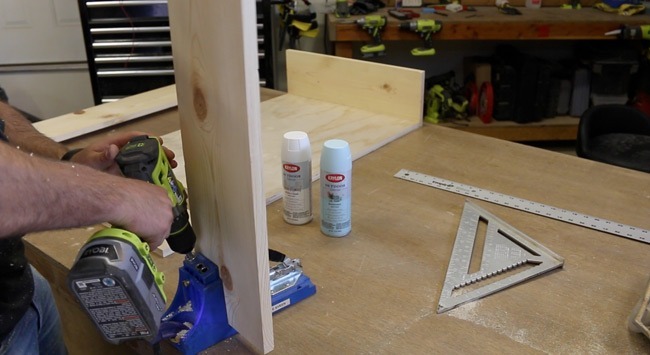 The space between the two boards is for the cleat mounted against the wall to fit into place. 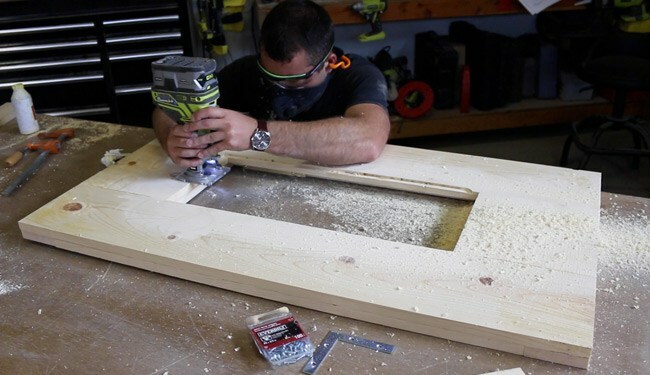 The plywood and cleat can be attached flush with the back of the frame using pocket holes. 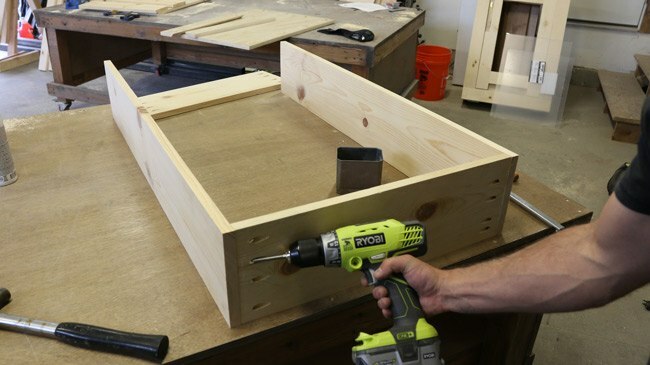 Determine placement for the wine glass holders and then use a drill bit and jigsaw to create each slot. 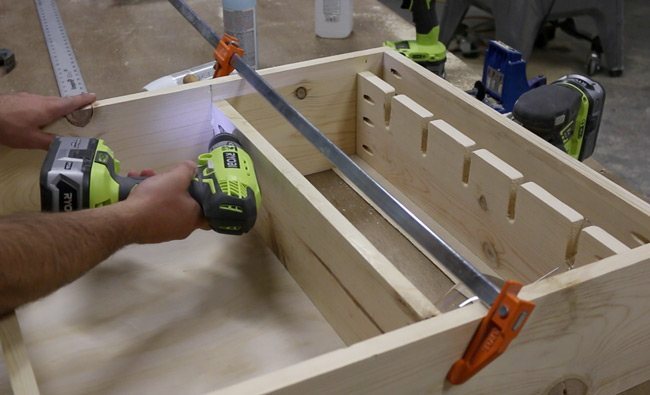 Attach the remaining shelves using pocket holes and screws. Feel free to vary the heights to best fit your needs. The box and shelves are done! 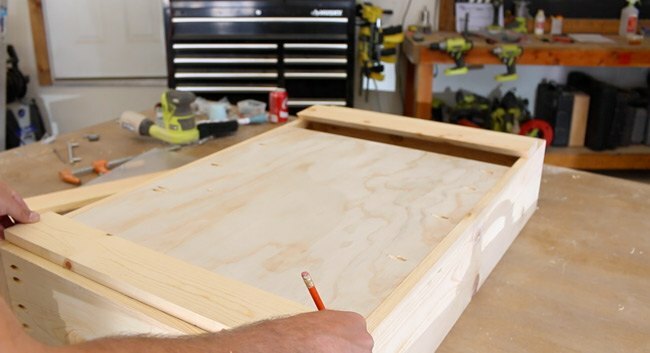 The front and table are constructed out of 1×8 and 1×10 boards. Do your best to find as flat of boards as possible at the lumber yard so you have a flat table that doesn't warp. 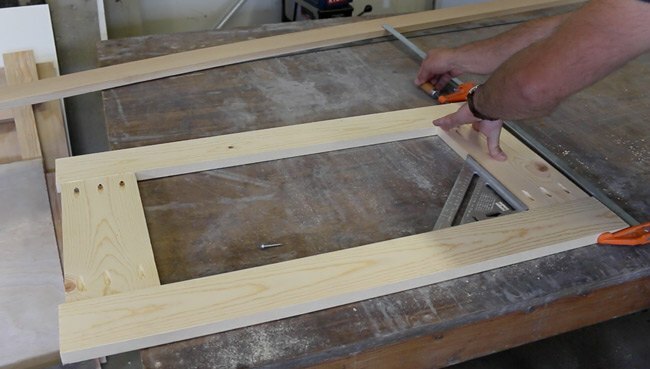 Attach the boards around the perimeter with wood glue and 1 1/4″ long nails. I ripped the two longer side boards to 2 1/2 inches in width. The leg is made out of 1×4's. The legs are connected at the top and bottom with 1×6 boards that I cut down a bit. 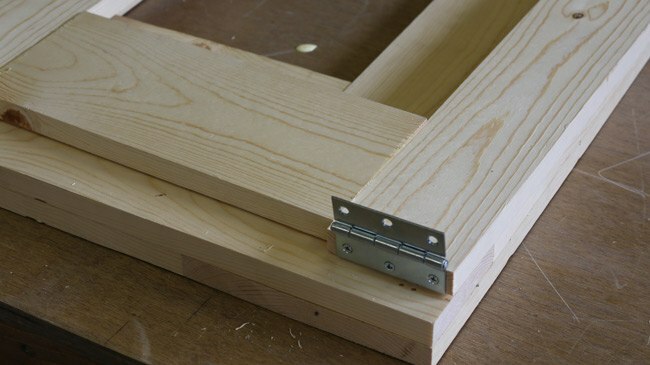 Add 3 inch hinges to the top of each leg. 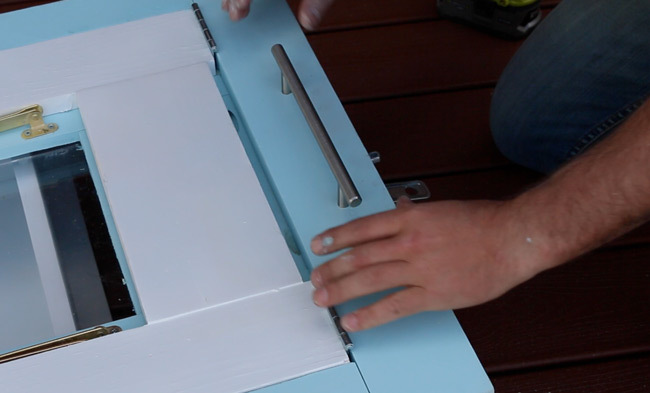 Attach a lid support to each side. 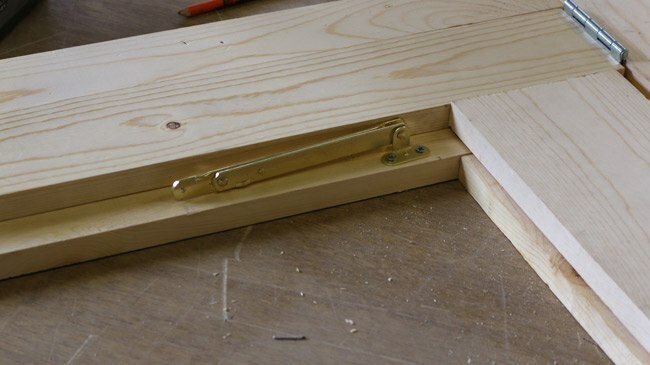 This will lock the legs in place at a 90 degree angle when the table is being used. The lid supports are a bit tricky to install. I actually had to play around with them a fair amount before I got them to work perfectly. 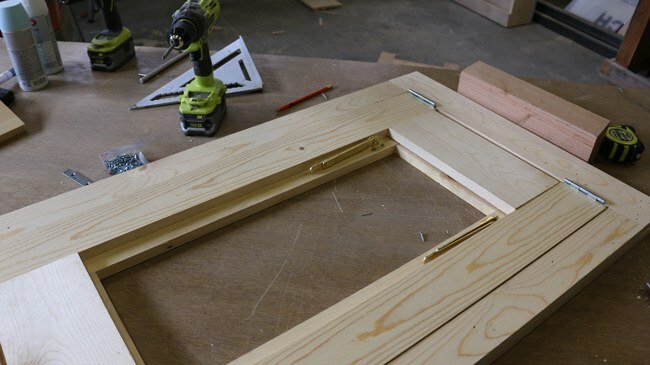 A look at the hinges installed. 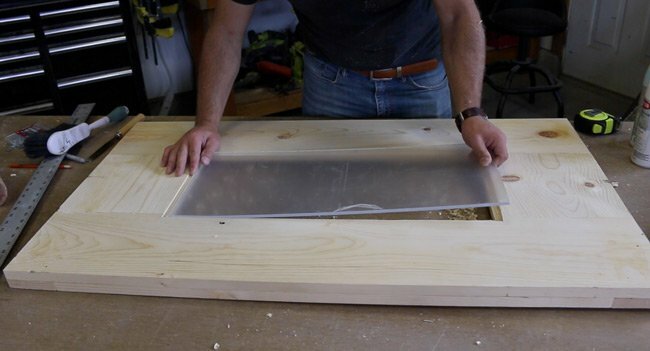 Use a router and rabbet bit to create a lip for the acrylic panel to sit in. The lip should be the same depth as the panel. 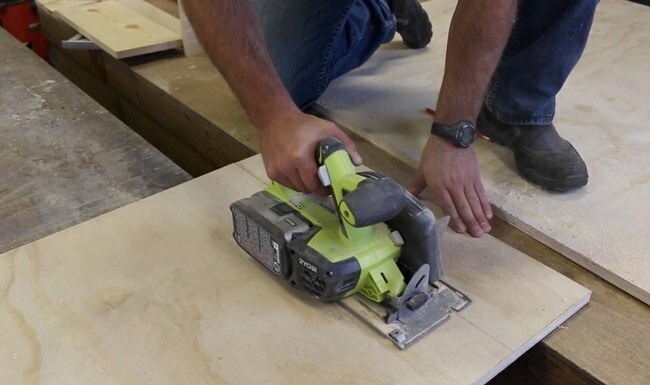 Use a hand chisel to square up each corner after routing. Test fit the acrylic panel prior to painting. 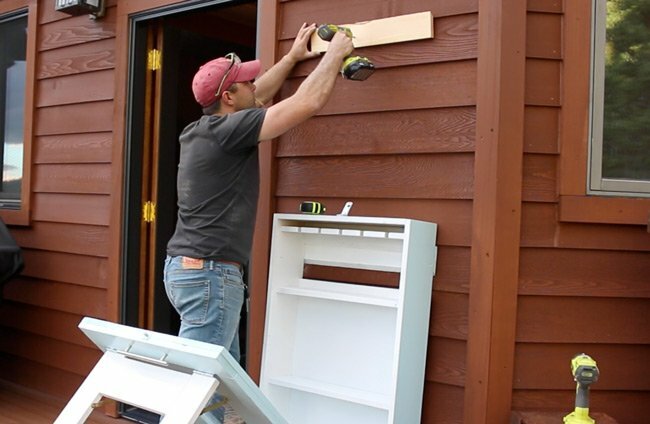 Add spacers to the back (optional) — if you have siding that prevents the cabinet from resting flush against a wall. 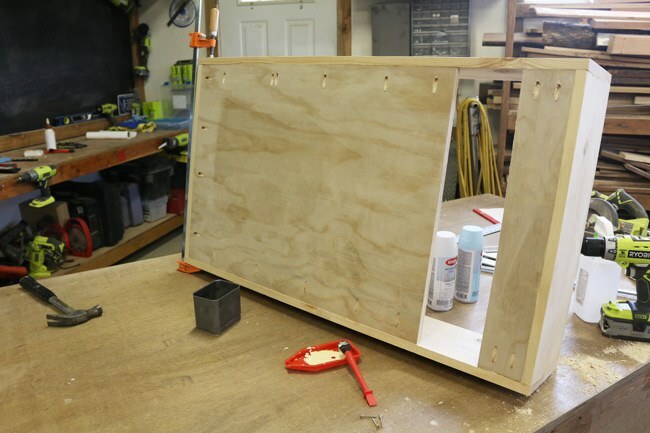 This would also provide space for wiring LED lights if you'd prefer to have them hidden. 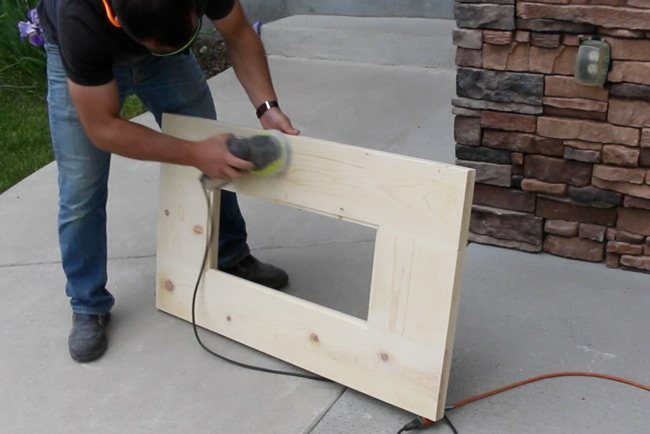 Use 220 grit sandpaper to smooth out the wood. 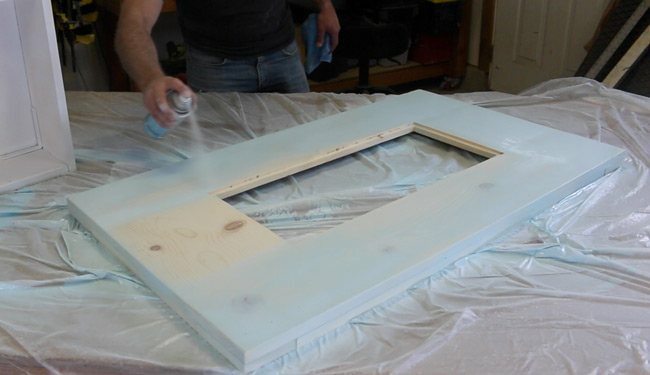 Use a damp cloth after sanding to remove any dust prior to painting. Adding a finish of your choice will bring your new murphy bar to life! I chose to use Krylon Outdoor Décor Rainwater satin and Whitcloud satin paint. Here is a look at the first coat going on. 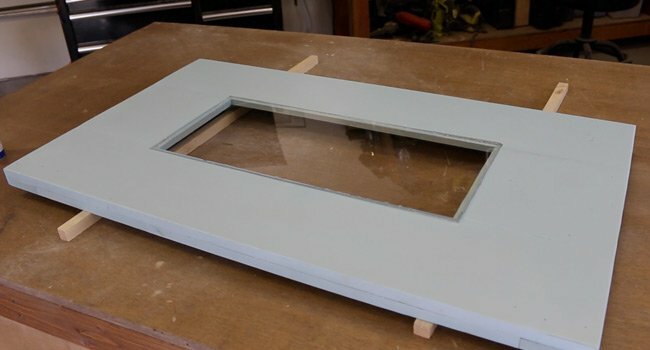 Apply 3 coats of the paint so you get a nice even finish. Always make sure you are in a well ventilated area and don't forget to wear a respirator! Here I'm finishing up with the final coat of paint. I like this paint because it works great for outdoor furniture. 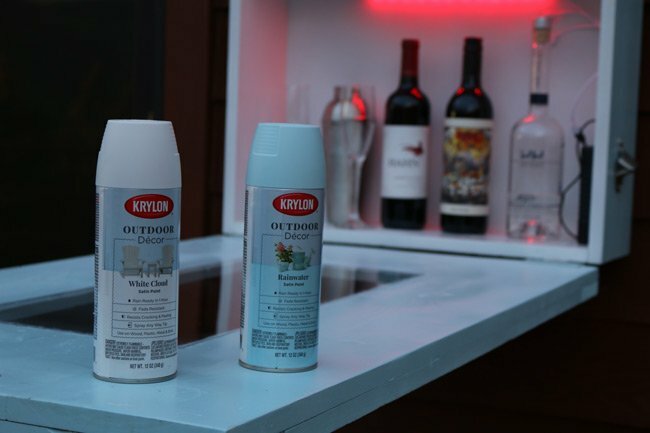 Krylon Outdoor Decor paint drys quickly and is rain ready within 1 hour. It also resists fading, peeling, and cracking. 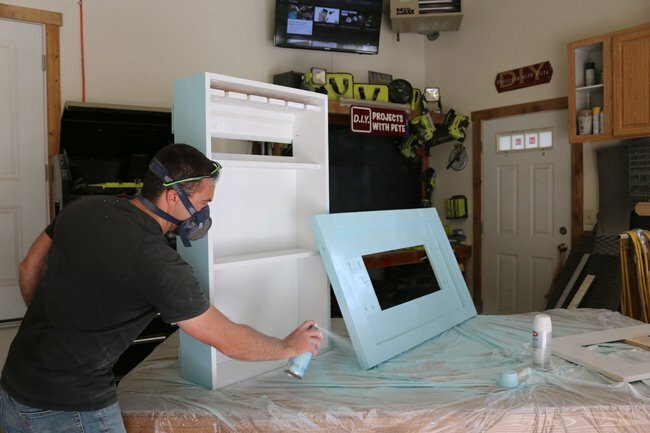 Let the paint dry before adding the acrylic panel and reinstalling the hardware. Add a clear epoxy to the lip and then insert the acrylic panel. Re-install the hardware after painting. Accessorize the cabinet with handles, bottle openers, cap catchers, grill tool hooks, and anything else you'd like! 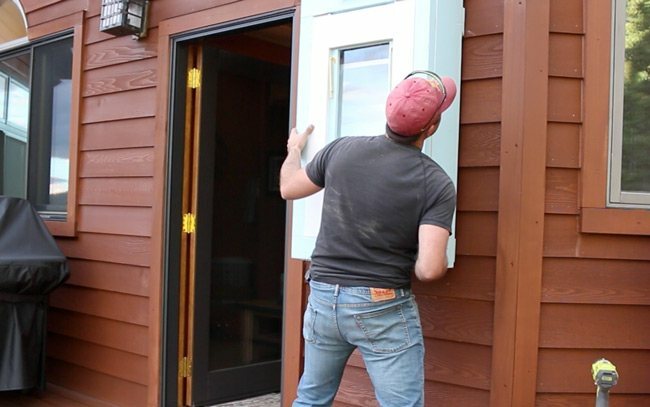 Add a 45 degree cleat to the wall or siding. 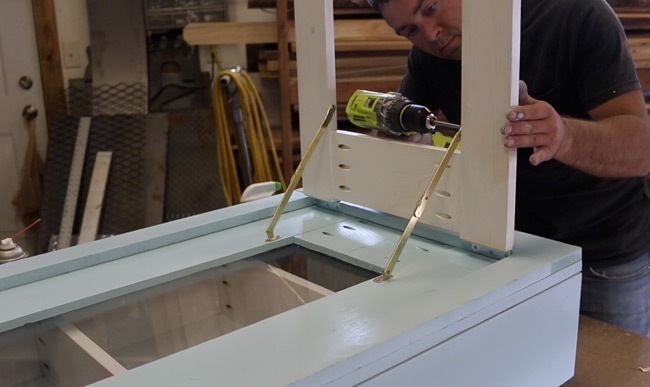 It will need to be at the correct height so that the table legs touch the floor and are at a 90 degree angle with the table top. Lift the murphy bar and hang it in place. 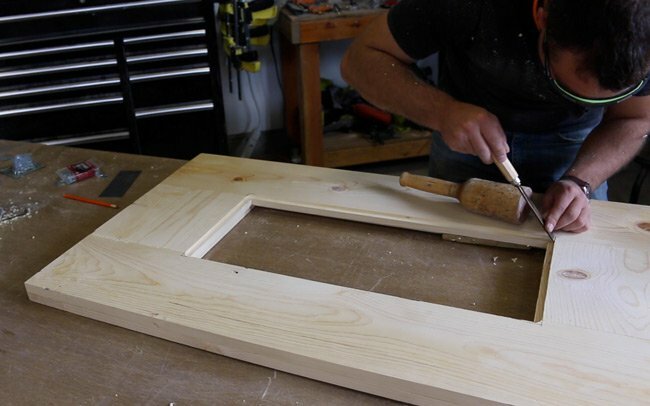 Next, use a couple screws to secure the cabinet. 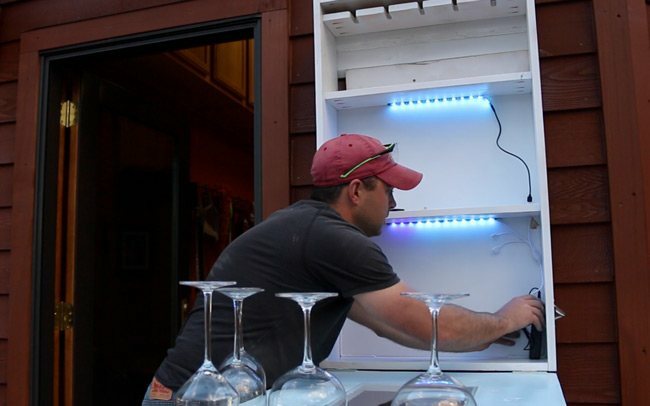 Add LED lights to the project to make it the talk of the party! I used a rechargeable battery pack and short LED strip lights. I hope you enjoyed checking out how this murphy bar was made. Please share photos of your completed murphy bar in the comments below. I'd love to see what you come up with! Cheers from Montana.